Uniprix Stadium is best known for being the home of tennis royalty as part of the annual Rogers Cup. It’s there that the pinnacles of professional tennis, such as Novak Djokovic, Roger Federer, Serena Williams and Eugenie Bouchard have come to entertain the throngs of people gathered at the stadium’s large outdoor courts. 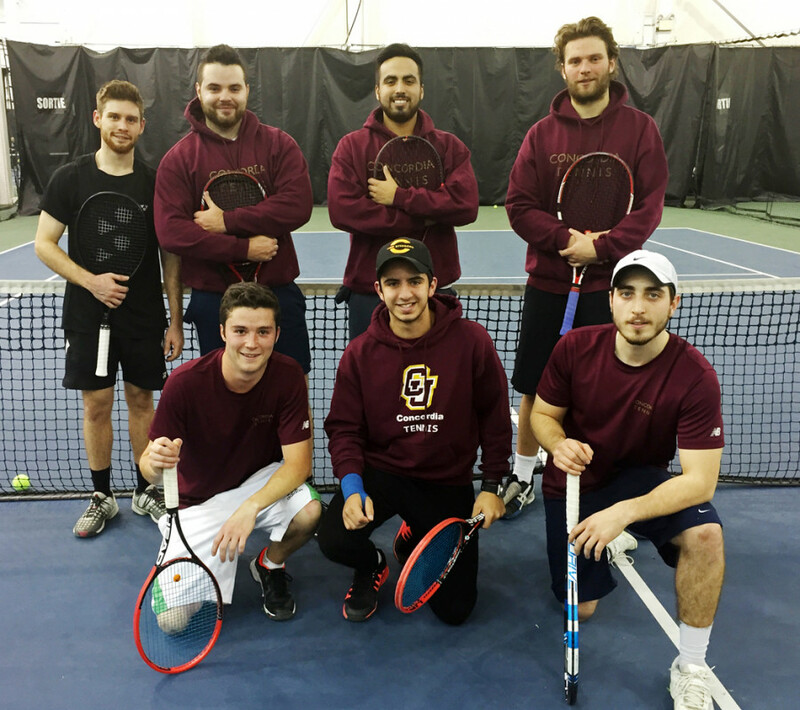 On a cold winter’s night last Thursday, the injury-depleted, yet confident Concordia tennis team held their bi-weekly practice in the stadium’s indoor courts, with hopes of one day reaching similar heights. They practiced hard on the backcourts of the complex, in burgundy red gym shirts and cardigans with “Concordia Tennis” across the front. The players broke off into groups of two to play mini-matches. The points ran continuously, interrupted only by the tennis ball hitting the net, forcing the server to reach into their pocket for a fresh tennis ball. “We are improving and finding a lot of players from Quebec. The level is upgrading from year to year,” said head coach Dominic Labelle. The Concordia Tennis Team quietly began three years ago, recruiting only local, recreational players looking for a fun time. It has since blossomed into a competitive and talented group. The team plays in the six-team Quebec division of the University Tennis League. Concordia’s team, which consists of 15 players—both male and female—play against various clubs across the province such as McGill, Université de Sherbrooke, Université Laval and more. It’s become difficult to succeed on such a grand stage due to the lack of funding from the university’s athletics department. The team is currently recognized solely as a sports club by the university and not as a varsity team. As a result, they cannot be branded as the Stingers, nor can they wear the traditional Stingers logo on their game day attire. The group is also entirely self-funded, paying out of their own pockets for court reservations, travel expenses to games and uniforms. The only privileges given to the tennis players are memberships to the university’s downtown gym. Serfaty claims that most students are fans of the game and have a passion for the sport, yet are unaware of the existence of a team at their own university. He is convinced that more support from the school will help change that reality. “We believe we should be a sports team at Concordia,” Serfaty said. “We want to wear the Stingers logo and be proud to represent our school. Being funded would help motivate the players and create a following and help the league in general. Serfaty knows firsthand the power that support and extra motivation can have on the performance and overall success of the tennis team. Team captain Jason Savage cites the lack of tennis facilities on campus, and the irregular match schedule as contributing factors to the unpopularity of the tennis team. Savage also recognizes that the lack of school funding has been detrimental to his group. Despite these challenges, the team remains committed to changing their reality. They have set up a Facebook page under the name “Concordia Tennis Team,” where fans can keep track of games and results. The group also plans on organizing fundraiser nights, such as a “Learn From the Pros” tutorial evening, where students can learn the intricacies of the game from the players themselves, all in an effort to promote the sport, procure added and get Concordia students talking about tennis. It is also hoped that the recent buzz surrounding professional tennis in Canada, thanks to Canadian Milos Raonic’s semi-final appearance at the Australian Open, will help spark interest in the players at the university level. The men’s team currently sits in last place through three matchups, having lost all five head-to-head confrontations collectively. But coach Labelle is optimistic. The women, on the other hand, have been struggling in large part due to lack of players. The team is often forced to forfeit matches since they are only made up of five players, compared to the typical six. Labelle envisions a tougher road ahead for the depleted group. Labelle and his team have their work cut out for them, but despite this, hopes and energy are high.